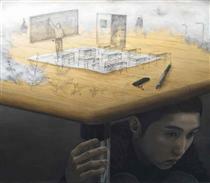 Tetsuya Ishida (石田 徹也, Ishida Tetsuya, June 16, 1973 – May 23, 2005) was a Japanese painter, best known for his surreal portrayal of contemporary Japanese life. 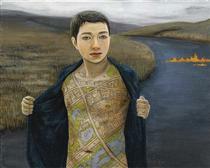 He died in 2005 when he was struck by a train at a level crossing. Tetsuya Ishida was born in Yaizu, Shizuoka, the youngest of four sons. His father was a member of parliament and his mother a housewife. He graduated from Yaizu Central High School in 1992. Ishida stated in interviews that it was during this period that his parents and school principal put pressure on him to thrive academically and develop a career as a teacher or chemist. This experience later appeared in some of his paintings that explore the society's expectations of youths. Ishida entered Musashino Art University where he majored in Visual Communication Design. He graduated in 1996. Ishida's parents, unhappy about his career choice, refused to provide financial support during his university period. Ishida recalled this with amusement in an interview. Ishida and film director Isamu Hirabayashi, a friend from his university days, formed a multimedia company to support their work together as collaborators on film/art fusion projects. Facing economic difficulties during Japan's 1990s recession, their joint venture shifted to become a graphic design company. Ishida left the company to develop his own career as a solo artist. From 1997 to 2005 he won a growing following, a number of awards and exhibitions, and positive praise of his works, which enabled him to work full-time as an artist until his death. On May 23, 2005, he was instantly killed by a train at a level crossing in Machida, Tokyo. He was 31 years old. Ishida's works feature three major themes: Japan's identity and role in today's world; Japan's social and academic educational structures; and Japanese people's struggles to adapt to social and technological changes in Japanese contemporary life. 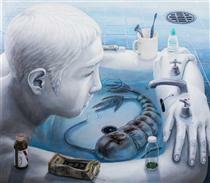 Ishida's works convey isolation, anxiety, crisis of identity, skepticism, claustrophobia and solitude. Ishida explored several motifs, including portrayals of school-boys and business-men as a part of a factory and young people as physically integrated with everyday household objects. Though the subjects in this series appear to resemble Ishida's own face, Ishida denied these works were self-portraits. Ishida shared anecdotes of his parents expressing bewilderment over his art style and the dark nature of his works. His mother was particularly upset by one of his self-portraits as she felt it was too dark, but he assured her that it was him at his happiest because he felt he could communicate better through his painting than he could in person. He later reported that his parents came to accept his works as part of his personality and that they, particularly his father, were able to appreciate his works even though they still didn't understand his art. 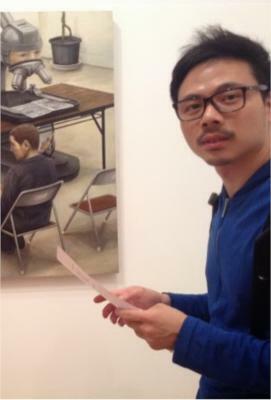 In a snippet from an archived television interview used during Tokyo TV's Kirin Art Gallery's feature "The Grand Art Masters", Ishida had stated that regardless of whether he liked painting or not, he felt compelled to continue painting "people at mercy of Japan's contradicting nature of its social systems for as long as they exist".